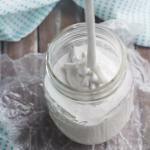 You’ll love having a jar of this Homemade Marshmallow Sauce in your cupboard! So simple to make and great for so many uses, from ice cream sundaes to fluffernutter sandwiches! Just five simple ingredients and naturally gluten-free. Hey guys! Once again, I’m dashing this one off in a hurry because my kiddos are about to blast through the front door at any moment and all hell’s gonna break loose! This is a really useful recipe that you’ll love having in your back pocket! It whips up really fast with only 5 ingredients, and it’s sooooo fluffy, sweet, and vanilla-y. I love it on everything from ice cream sundaes to peanut butter sandwiches. It’s a little thinner and more pourable than marshmallow fluff, but I think if you cut the water down a bit you’d have a dead ringer on your hands. Personally, I think the sauce consistency is more versatile. I LOVE this with chocolate ice cream. It really is my favorite of all ice cream toppings. You could also swirl it into your homemade ice cream recipes as they come out of the machine! But there are tons more uses, you’ll discover when you have a jar of this in your cupboard or fridge! I’m sorry to be in such a rush but they just busted down the door and they’re dying to tell me all about their End-of-School-Year Party! 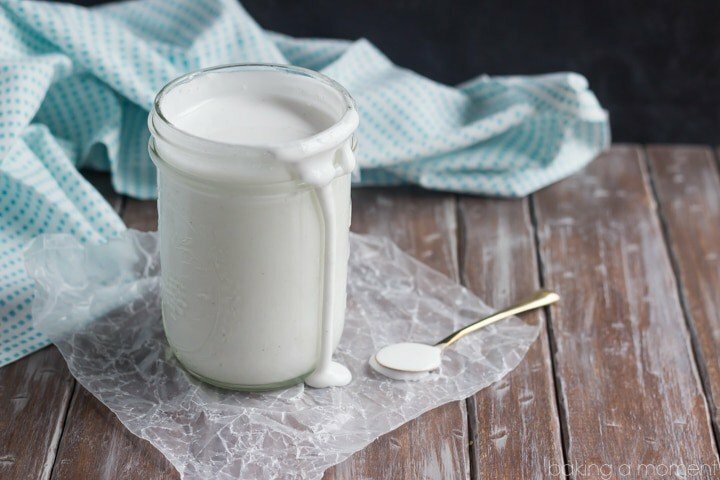 You'll love having a jar of this Homemade Marshmallow Sauce in your cupboard! So simple to make and great for so many uses, from ice cream sundaes to fluffernutter sandwiches! Just five simple ingredients and naturally gluten-free. Place the remaining water in a small pot, along with the granulated sugar, corn syrup, and salt. Place the pot over medium-high heat and cook, occasionally swirling the pot gently, until the syrup registers 240 degrees F on a candy thermometer. Carefully pour the hot syrup over the gelatin mixture, and whip on medium low speed for 2 minutes. Increase the speed to high, and continue to whip until the sauce becomes thick, shiny, and white. Stir in the vanilla bean paste and transfer to a large mason jar. Oh my goodness! This sauce is rockin’ my world!!! Hey Erin! How long after you made it did it separate? Was it right away or had it sat for a day or so? I believe it was overnight, may have separated before bit I’d not taken notice. I see. Well I have seen it separate after several hours or days- it’s definitely something that can be prevented by keeping it in the fridge. Refrigerated, it can keep for a few weeks without separating. I hope that helps! Oh Allie, this is going to be a hit at our house!! Perfect for ice cream sundaes and as a brownie topping with crushed graham crackers! Love it! Sounds great Mary Ann! I hope you and your boys enjoy! Do you think you could substitute honey for the corn syrup? I like to eliminate corn syrup whenever possible, plus I like the taste of honey. I like the taste of honey too. I haven’t tried it myself but it seems like it could work! Good luck Judy, and thanks for reading! This looks heavenly! All the s’mores things you could make… the possibilities here are endless! Yes! There are so many great uses, right? Thanks Medha! Thanks Kelly! I’m sure you could come up with some amazing ways to use this! I’m sure you can feel me Aida! Once the bus pulls away I can forget about getting anything else done, lol! Thanks so much for the sweet comment and I hope you have a great weekend! There’s so many things you could do with this sauce, but I think I want to put it on everything. Great recipe. Thanks so much Janette! Have a great weekend dear. What an awesome recipe to have in your back pocket! I am saving this one for later! Thanks Julianne! Hope you’re enjoying your Friday night! This sauce looks so delicious! I love using marshmallow fluff in most of my buttercream frosting recipes. This would be a great alternative whenever I run of fluff out in my pantry. I have never tried that but it sounds delicious! Thanks for the awesome idea Katy! Oh thank you! I found the set on eBay! I’ve been wanting to make my own marshmallow sauce for so many different things, like making the best fluffernutter ever! So glad you are sharing this recipe! Yay! So happy you like it Danae! Have a great weekend sweetie! Marshmallow sauce? Girl you know you are insane in the best way possible!! Wow! This is the coolest thing ever! Marshmallow sauce?! I am so surprised it has no eggs in it too. I will have to try! No eggs necessary! It whips up like a dream. Thanks Jessica! Hope you enjoy dear! Seriously amazed at all of the great things that come out of your kitchen! I haven’t had marshmallow fluff (homemade or store bought) in so, so long. Now I want to make a s’mores ice cream sundae! That sounds fabulous!!! I want one too! This looks so seriously good! Perfect for summer sundaes! Pinned! Thanks so much Ashley! Hope you’re having a great week so far hon. Oh my gawd….Allie! I love this post! Is it bad that I would just sit down on the couch with a spoon and a jar of this!? 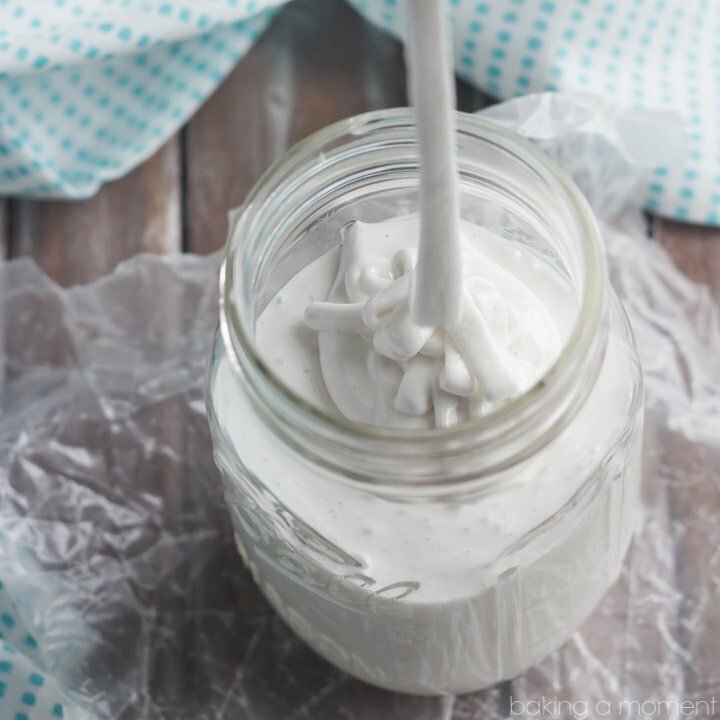 Allie – Homemade marshmallow sauce?! Yes. This looks like such a treat. Allie I need a giant bottle of this SAUCE in my fridge like NOW!! I can seriously go crazy with this stuff!! Pinning! Haha right??? I’m planning on doing just that. Thanks so much Ami! Allie, this marshmallow sauce is amazing!!!! oh the things I could use this on! my kids will love this! beautiful! Thank you so much Alice! Hope your week is off to a great start my friend! Thanks Jessica! It’s so easy to throw together- hope you enjoy! Thanks Jessica! I hope you enjoy! Have a great week hon! 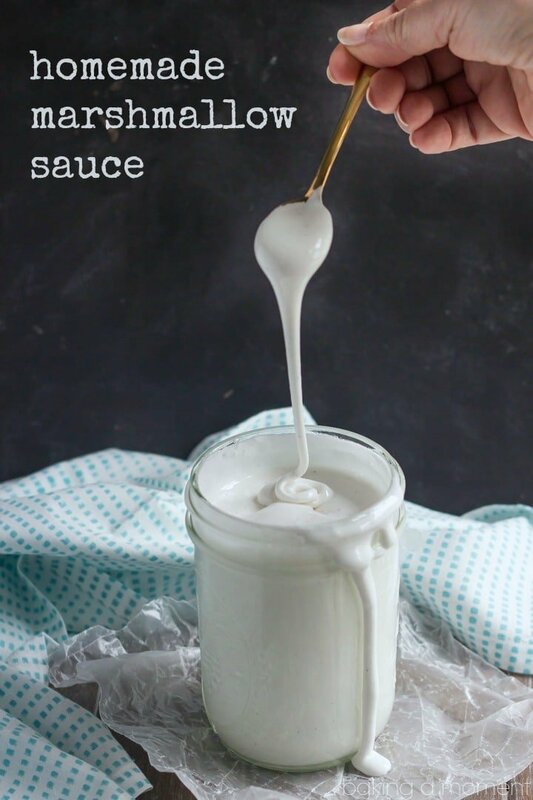 Love that you made homemade marshmallow sauce! Such a delicious idea, Allie! I could think of so many great uses for this but truthfully I think I would have a hard time not eating it by the spoonful! 🙂 So delicious! To be honest I’m having a very hard time with that! Thanks so much sweetie! I can see so many sweet things to make with this sauce! Probably not. But hey, you can always whip up more since it’s so quick and easy right? Thanks Marissa! Ally or anyone else read the post does anybody know if you can make the sauce with regular marshmallows. Hey Susan! No I haven’t tried that- this recipe is meant to just be super-simple and from scratch. Thanks for reading and for the great question! How was I unaware that marshmallow sauce was a thing?? Snap, I am all over this idea! And only five ingredients – I am sold! Oh my gosh, yes! It’s so good girl. You have to try it on chocolate ice cream! Best thing ever! What is marshmallow sauce? I think I want this slathered all over everything I eat from now on!! Haha right?? It’s so good! I’d say at least a couple of weeks. It’s nothing but sugar and gelatin, basically, so should be pretty shelf stable. Thanks for the great question! This is brilliant. I can think of several ways I’d use this amazing marshmallow sauce!! Yay! I’m so happy you like it Renee! Thanks so much for the sweet comment. ahhhhh all I want is peanut butter ice cream smothered in this stuff!!!! I think that sounds phenomenal! S’mores is totally my favorite dessert combo. Just decrease the water a bit and I think that should help to make it thicker. Enjoy! I’m in love with marshmallow anything and everything. Seriously cannot wait to try this! I’ve never tried making marshmallow sauce before but I think I’m going to finally have to give it a shot. Love the gif of the the twirly dripping sauce. So awesome! Made this today so that I could make your Chocolate Marshmallow Rice Krispie Treat Ice Cream. The recipe was perfect, actually I should say both recipes were perfect. The marshmallow sauce came out great, even with me forgetting the vanilla. For those that wanted a thinker sauce, a couple of hours in the fridge worked for me. Awesome! So happy you liked it Jessica. Thanks for sharing your feedback! How much does this recipe.make. Hey Jackie! I’d say somewhere in the neighborhood of 24 ounces. Hope that helps! I tried this with a vegan gelatin and it didn’t work. It didn’t turn white even after 30 min of mixing (how long are you supposed to whip it)? The next morning I whipped three egg whites and added the warmed mixture from your recipe to the egg whites, and whipped them for another 10 minutes, and it turned white. Thoughts? Hm, I’m sorry you had trouble Lauren. I’m guessing that vegan gelatin does not work in the same way as the regular kind. I used Knox brand in this recipe and the results have been consistent over the last 3 or 4 times I’ve made it. I haven’t tried using egg whites. Are you trying to make a vegan version? I’m thinking that’s probably not your concern since you mentioned egg… I would try it with non-vegan gelatin, in my experience that works well. I made this last night as a part of a collection of sweet sauces for my sister and boss for Christmas. Let me just say….holy rusted metal, batman, this is amazing. My husband was dipping iced sugar cookies in it and is very upset that I’m giving it all away. I tasted it again this morning (had to make sure it stayed good, of course). Just as good. Thanks for the recipe, I will be making this frequently, I’m sure. What a FUN idea! I would absolutely love to receive a collection of sweet sauces! So happy you and your husband liked the marshmallow sauce. It’s definitely a favorite for my family as well. Happy holidays Sarah! Hi Allie, I have tried making this recipe twice now and both times it has come out really thin, almost like a soup. Is there a reason this may be happening and what can I do to fix it? Thanks Allie! Hey Sarah! Does it get thicker as it cools? That’s what usually happens when I make it, but if it’s still runny when cool you could probably decrease the water a bit. Does this sauce harden in the freezer? Looking for something to add to ice cream and I do not want it to become too hard. Thanks for letting me know. Hi there! It does thicken up a bit but I wouldn’t say that it becomes hard. It’s still soft and sauce-like. I’ve actually used it in an ice cream recipe (https://bakingamoment.com/chocolate-marshmallow-rice-krispie-treat-ice-cream/) and I was happy with the way it turned out. Check out the pics and you can probably get a good idea of what it does when frozen. Good luck! I just started making snowballs for family parties. This recipe is wonderful for the topping. No eggs and no worries about who is allergic. Oh that’s so great! I actually have a recipe for snowball cupcakes here: https://bakingamoment.com/snowball-cupcakes/. Maybe you’d like it! Thanks for reading and for the great feedback. When I said snowball topping I was talking about iced like snowcones. Topping is great for that. Oh, I see! I guess I’m not familiar with that kind of snowball, lol! Must be a regional thing. Well, I’m very happy you like the sauce! Thanks for the great feedback! Hi Allie, I love marshmallow-y things and printed this recipe out a few weeks ago. Finally made it tonight! I have my chocolate ice cream ready… can’t wait. What a fun and delicious recipe… Thanks so much!! We made this sauce and it is delicious! We did notice that after 2 days on the counter it began to separate or turn back to syrup. (We did not know that we should have refrigerated it). Can we reheat and re-whip the mixture? Is there any way to fix it? Hey Chris, I’m so sorry you had trouble! I always store mine in the fridge, and I will be sure to add a note to the recipe card. It’s possible that you could revive it by re-whipping. Good luck! Hi Allie – This recipe looks amazing, and I’m looking forward to trying it very soon. I apologize if you’ve already answered this question, but could you ballpark for me the shelf life of a jar if kept refrigerated? Love your site! Hey Sarah, no worries! Keeping it refrigerated will definitely extend the shelf life- it will probably keep for around 2-3 weeks before you start to see it beginning to separate. Hope that’s helpful! Perfect! Very helpful – Thank you. This will be a huge hit in my house! What a great addition to a hot fudge sundae!!! Yes, that’s right Jhosi! It is a sauce and although it does become thicker as it cools, it remains thin like a sauce. It does not set up as firm as the candy does. Hope that’s helpful! I never even thought to make my own, but it looks so darn good! So many awesome ideas for this! I’m having an ice cream sundae bar for my son’s 8th birthday, just wondering what the shelf life for this is outside of the fridge? It looks perfect! Hey Adam! Thanks for the great question. This keeps well at room temperature for around 12 hours or so. After that, it starts to separate. You can stir it vigorously to bring it back together, but I prefer to just keep it in the fridge. It lasts in the fridge for at least a week without any problem. Happy birthday to your son! Wow! I have never seen so many positive comments in one place! This is going in my fridge tomorrow morning. I love your glass mixing bowl. Could you tell me where you purchased it, please? Hey Sharon! I’m so glad you’re going to give this recipe a try. I hope you love it as much as I do! Here’s an Amazon affiliate sales link to the bowl I have on my mixer: https://amzn.to/2AcSGfF. Thanks!